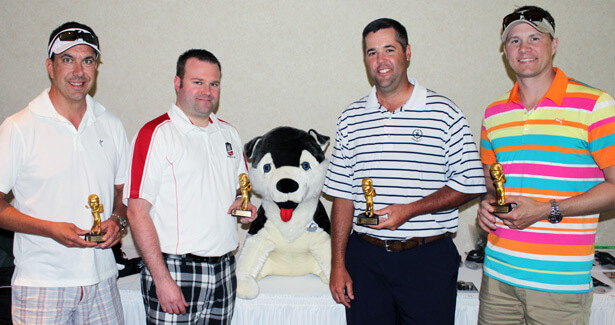 The NIU College of Law Alumni Council held its 10th annual golf outing June 6 at River Heights Golf Course. Golfers drove and putted their way around the course on a beautiful afternoon, all to have a good time and raise money for student scholarships. Proceeds from the generosity of sponsors and golfers go toward the NIU Law Alumni Council scholarship program, which gives an annual scholarship to a graduating student, and supports other student-related programming events. This year’s winning foursome included alumnus Riley Oncken (’04) and his teammates Jason Friedrichs, Grant Goltz and Jason Hiland. Other program highlights included committee co-chair Nick Valadez (’89) presenting prizes to the top golfers of the day. Valadez also brought and introduced the newest golf mascot, a large stuffed Huskie, which became the centerpiece of many treasured photos during the evening and served as a proud symbol of the NIU spirit. The winning foursome at the 2014 NIU Law Golf Outing included (from left): Jason Hiland, president/CEO of HurricaneGolf.com and Diamond Tour Golf; Alumni Council member Riley Oncken (’04), Riley N. Oncken, P.C. ; Grant Goltz, vice president at National Bank and Trust Co.; and Dr. Jason Friedrichs, CGH Medical Center. Dinner Sponsors: NIU Law Alumni Council and Smith Amundsen. Beverage Sponsor: Whiteside & Goldberg, Ltd. and Vella & Lund P.C. Lunch Sponsors: Illinois Institute for Continuing Legal Education and Hon. Melissa Tomaska Olivero (’97). Major Gift Sponsors: American Liquors, Diamond Tour Golf, Illinois Institute for Continuing Legal Education and NIU College of Law.